It’s so easy to become overwhelmed by what we see around us, and by what we experience, that it can push us into the position where faith becomes relegated to Friday prayers and fasting during Ramadan. It then becomes difficult for it to be anything more. Sometimes, we find ourselves in this position because we feel as though we are drowning, other times due to negligence, and others still, due to feeling alienated. This lecture examines the current state of Muslims, from our addiction to social media to keeping abreast with scandals, and asks: “where are you?” Trapped by distractions and alienated by the moment, how can we change our condition when so many of us aren’t even aware of our mental and spiritual state? How do we preserve our faith and remain engaged in just causes without burning out? How do we take care of our souls during times of confusion? Aftab has taught at the annual Rihla summer retreats, and is currently preparing material for his new course on post-modernism and its impact on Muslim activism today. His book, The Broken Chain: Reflection upon the Neglect of Tradition, explores the depth and breadth of Islamic scholasticism in regards to the veneration of the Prophet Muhammad, upon whom be blessings and peace. Between 2013 and 2015, Aftab served as the Scholar-In-Residence at the Lebanese Muslim Association (LMA) in Sydney. In addition to delivering public lectures, and overseeing youth-based projects, he created and taught the Positive Intellect Program; an intensive 5-week course that sought to provide the intellectual tools for young Muslims living in the West to navigate the tides and challenges of modernity. Event Supported by: LaTrobe University Islamic Society, Islamic Museum of Australia, Muslim Professionals Association, Bright Young Minds and Green Crescent Australia. For more information about Sanad Foundation, go to About Us. The Sanad Foundation aims to progress the growth of its scholarly Islamic foundation in Australia and to sustain our current initiatives. To do this, we're asking for our community's help to play an active part in supporting and contributing to our shared success. This will enable Muslim Australian students of knowledge to connect with our rich Islamic tradition abroad, to pursue the path of scholarship and return to make an active contribution to the Australian Muslim Community. When: Saturday 5 May 2018. Keynote Speech: Aftab Malik, a global visionary and a rising intellectual star, lecturer and published author. 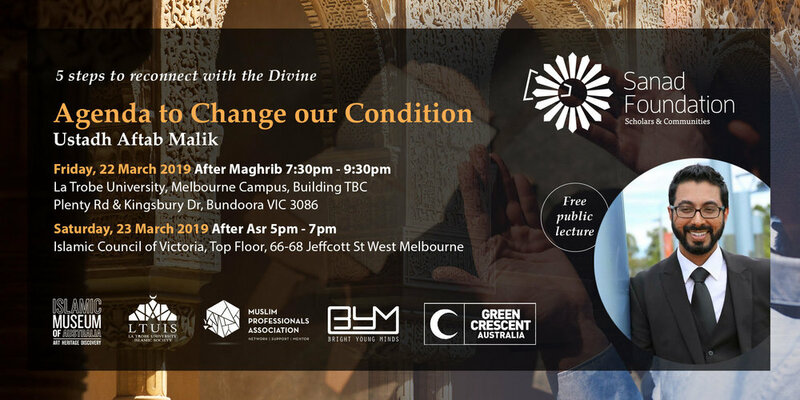 Event Supported by: UMMA Centre, Islamic Council of Victoria and Board of Imams Victoria. You are invited to the Sanad Foundation Pre Ramadan Dinner. 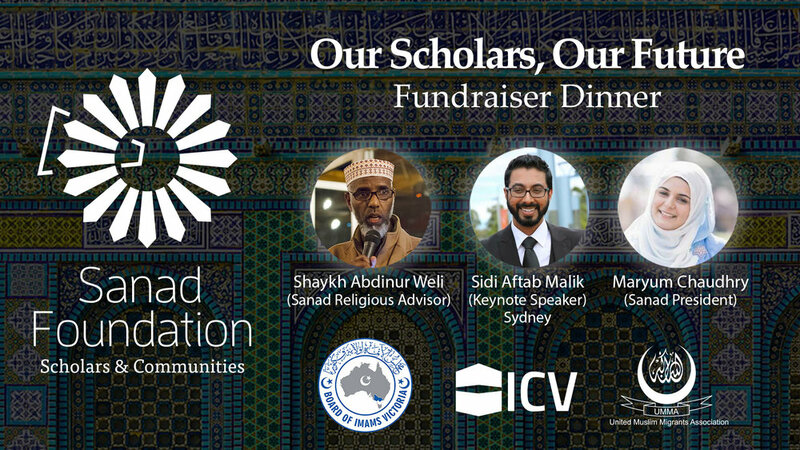 This event involves fundraising for the strengthening of the Islamic tradition of Scholarship and its beneficial connection to our communities in Australia.